Description: SIG SAUER P238 .380 ACP Rainbow Titanium with Rosewood Grips(238-380-RBT). It’s just a fraction of the size of our full-size pistols. A smart looking, small handgun built with the same accuracy and reliability as large frame SIG SAUER pistols. With an overall length of just 5.5 inches a height of 3.96 inches, and weighing just 15.2 ounces, the SIG SAUER P238 is the ultimate firepower in an all metal frame concealed pistol. The P238 is built on an anodized alloy beavertail style frame with rosewood grips for comfort and a secure hold during rapid-fire usage. The stainless steel slide features the popular trademarked SIG SAUER slide serrations, corrosion resistant Rainbow Titanium finish and SIGLITE® Night Sights. 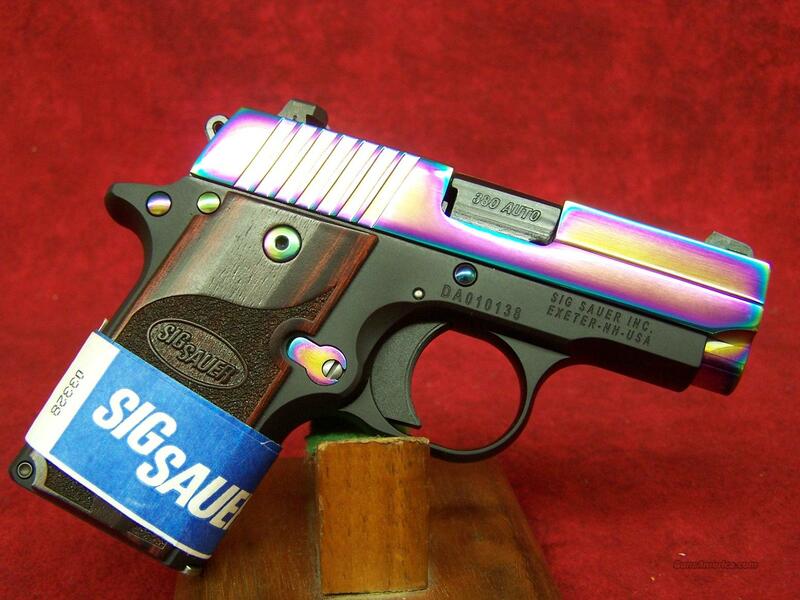 This new SIG SAUER P238 Rainbow is shipped in a lockable hard case and one 6 round magazine.